It's no secret that the South is both growing and its demographics changing -- two trends that make this an exciting and volatile moment for the region's politics. As many Southerners can tell you, one of the biggest changes is the influx of newcomers to the region, both from other parts of the country (migration) and from other nations (immigration). The South is the fastest-growing region in the country, and as the 2010 Census showed, newcomers account for a big share of the South's expansion. What does it mean for the politics of Southern states? The impact of immigration -- especially the growing Latino vote -- has been widely discussed, and for good reason. As new data from the Census Bureau shows [pdf], a pivotal factor in last year's elections was the nation's rapidly diversifying electorate. But what about those who are native Southerners, born and raised? 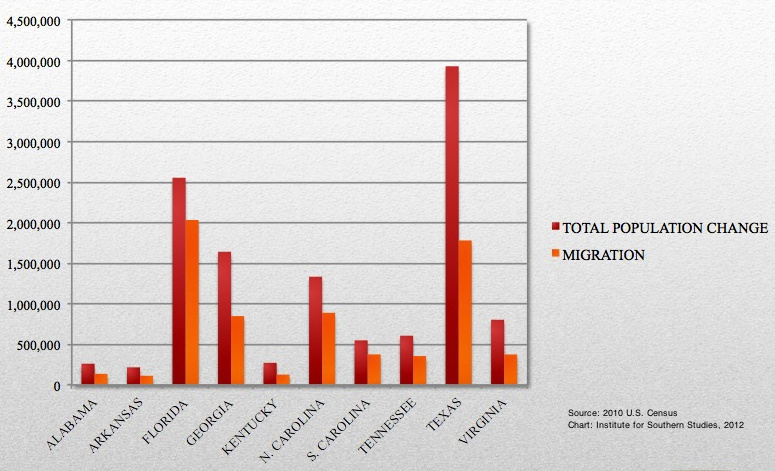 What makes the South interesting is that, while much of the region is a magnet for newcomers, it also has high rates of people who stay in the states where they are born. Demographers like those at Pew Research call this a "sticky" state -- one where people stick close to home. As a result, even in states that have seen many newcomers like Arkansas, Tennessee and Texas, the population has more native-born residents than the national average. The most dynamic Southern states are those that are both "magnets" and "sticky" -- Florida, Georgia, North Carolina and South Carolina rate high for new residents as well as people who stay put. By drawing new people and holding onto those that are already there, these are among the fastest-growing -- and, increasingly, politically influential -- states in the region and country. 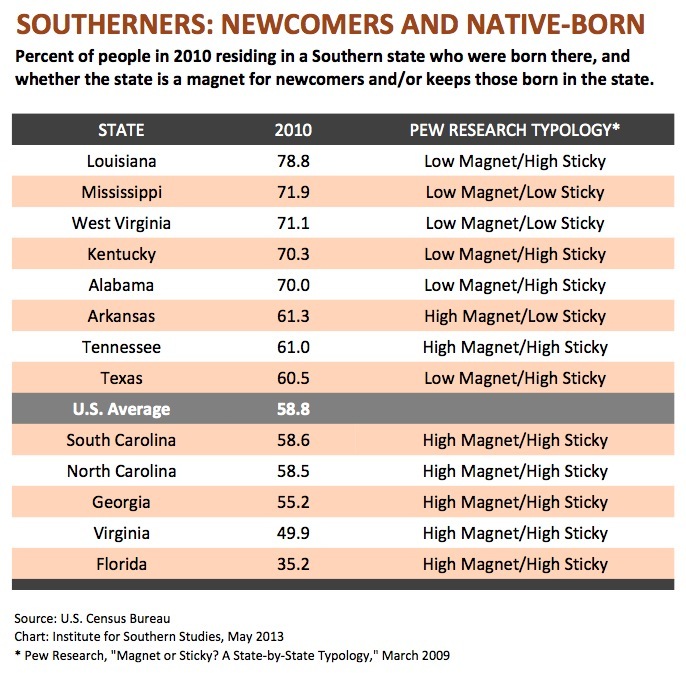 This chart shows what percent of residents in each Southern state were born in that state, and whether it's classified by Pew as a "magnet" and/or "sticky:"
It's clear that low-magnet Southern states continue to be more conservative. As for the magnets, there's a wide political spectrum, from battlegrounds like Florida and North Carolina to states like South Carolina where the influence of demographics has yet to significantly transform the electorate and political culture. [O]ver the last century, Virginia saw the largest decrease in the percentage of people living in the state that were born there (as well as the sharpest downward slope). For the first time in the modern era, the 2010 Census recorded that a slight majority of Virginia residents were born outside the state. Those newcomers are helping to push Virginia blue: As a pre-election poll found, those who had lived in the state 30 years or lessr favored Obama; those who had lived in the state 30 years or more favored Mitt Romney. Virginia is an extreme example, but if current trends hold, all Southern states will be transformed in some way by the changing blend of Southerners, new and old.